Johnny Sebastian wrestles with an opponent. The junior was NU’s top individual finisher at Big Ten Championships this weekend. 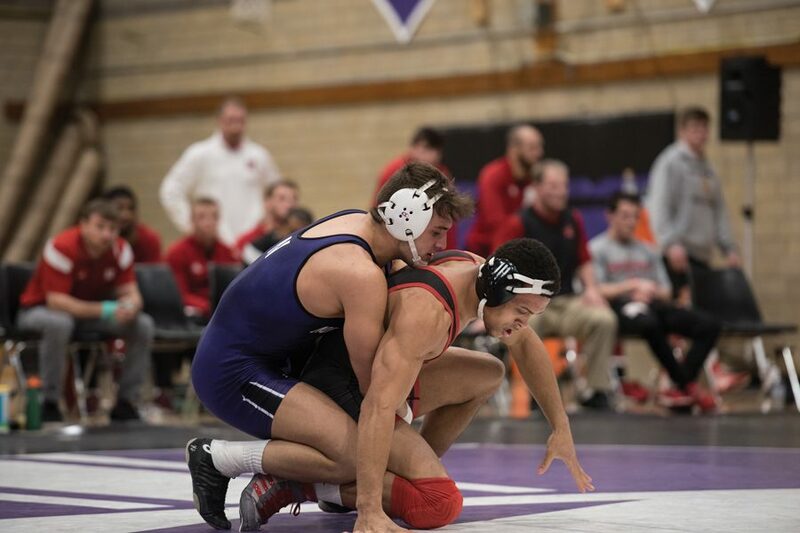 Northwestern had a successful start to its postseason, with five Wildcats finishing in the top eight in their respective weight classes this weekend at the Big Ten Championships in East Lansing, Michigan. Five individual placings is the most for NU since the 2015 campaign when six placed, and four wrestlers who placed on Sunday will go on to NCAA Championships in Cleveland in two weeks. The best performance came from junior Johnny Sebastian who finished fourth in the 174-pound weight class. His top-5 finish was a career best after placing seventh at the conference championships last year. Sebastian said his better finish this year is partially because his body is healthier, but also because he is in a more comfortable weight class. A pair of redshirt freshmen, Sebastian Rivera and Ryan Deakin, were also notable finishers. In the 125-pound weight class, Rivera clinched the fifth place spot after his opponent, Nick Suriano of Rutgers, medically forfeited. Deakin, meanwhile, medically forfeited both of his matches on Sunday, giving him sixth place at 149 pounds. The team finished in 10th overall, a team high since the Cats’ 2015 season in which they finished ninth. Coach Matt Storniolo said he was proud of the way the team competed. He emphasized that three more wrestlers were on the podium this year from last, which he described as a reflection on the program’s trajectory. Sophomore Zack Chakonis also placed in his 197-pound weight class, receiving an eighth-place medal in his Big Ten Championships debut. Conan Jennings, a junior, finished in fifth, his second straight year placing at Big Tens. After being pinned in the consolation semifinals, he came back with a decision to clinch the fifth-place spot for the heavyweight division.